I mentioned earlier that this was a double drive model. It will actually operate as single or double drive. Here’s what that means. The drive belt (special string, but string nonetheless) goes around the wheel twice. 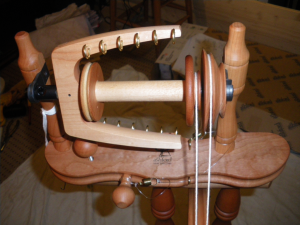 In double drive mode, one loop is on the bobbin and one is on the flyer pulley. So the bobbin and flyer are both driven directly, hence double drive. You can see that there is a second groove on the flyer pulley. This allows a different drive ratio to be used. All this movement of the belt changes the tension but there’s a cunning knob and hinge arrangement to retension it. 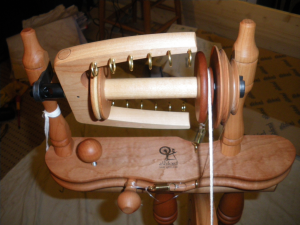 In single drive mode, both loops go around the bobbin. A brake band (transparent so hard to see, but it has springs at each end to ensure tension which may be easier to spot) is put onto the flyer pulley to stop it turning. Only the bobbin is driven, hence single drive. Specifically this is “bobbin lead” or Irish Tension single drive. Alternatively, you can single drive the flyer pulley and brake the bobbin. That would be “flyer lead” or Scotch Tension single drive.